UPDATED: Sat., Sept. 30, 2017, 2:55 p.m.
DOVER, Del. 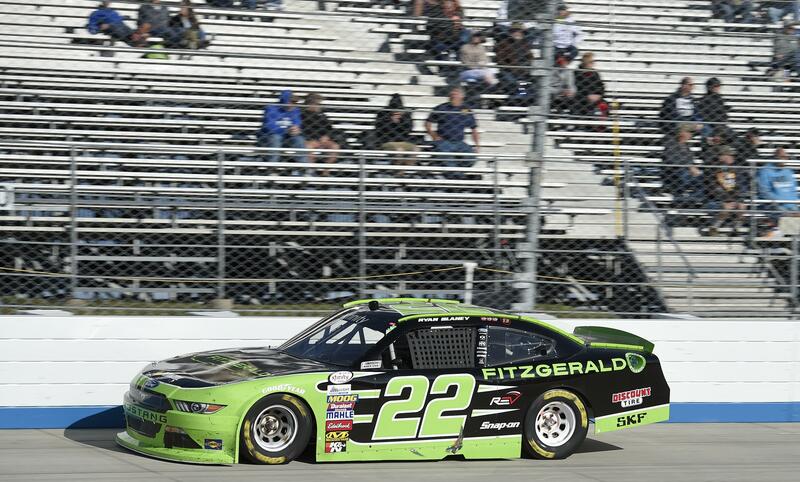 – With a checkered flag missing and no highlight reel burnout to be found, Ryan Blaney may at least want to keep the race trophy as a keepsake to prove he won at Dover. Blaney crashed the Xfinity Series playoffs and the Cup regular dominated Saturday at Dover International Speedway. “It’s really hard to get a car like that,” he said. NASCAR imposed limits this season on how many times the elite Cup drivers can race in NASCAR’s second-tier series. But no rule could stop Blaney from reaching victory lane. Blaney made the Cup playoffs with a win at Pocono and played spoiler at Dover in the second race of the Xfinity playoffs. Blaney, a social media darling in NASCAR, took his checkered flag and slipped it through a fence to give to a young fan. Blaney recalled he was once that same excited kid when he tagged along at the track as the son of former NASCAR driver Dave Blaney and grandson of dirt track star Lou Blaney. Almost as happy as Blaney was to win it. Blaney, who usually gives a checkered flag to a team member, also skipped the traditional winner’s burnout. “It’s not really my thing,” he said. Xfinity playoff drivers took the second through six spots and nine of the top 11. Justin Allgaier was second, followed by William Byron, Daniel Hemric and Brennan Poole. The 23-year-old Blaney won for the second time in nine Xfinity races driving the No. 22 Ford for team owner Roger Penske. He led 136 of 200 laps and won his sixth career Xfinity race. Allgaier leads the standings by three points over JR Motorsports teammate Byron. The series moves to Charlotte Motor Speedway where the field of 12 drivers will be cut to eight. Blaney will drive a third entry for Team Penske in NASCAR’s top Cup series next year. Blaney will drive the No. 12 Ford and join Joey Logano and Brad Keselowski in team owner Roger Penske’s NASCAR lineup. Blaney was signed to Penske in 2012 and farmed out to race for Wood Brothers Racing. Blaney won his first career NASCAR Cup race this season for the Wood brothers at Pocono . Blaney starts 11th in Sunday’s Cup race at Dover. Published: Sept. 30, 2017, 1:56 p.m. Updated: Sept. 30, 2017, 2:55 p.m.